In the early 1850's there were several wooden structures built on the lot where the Masonic Temple now stands. In 1853 Charles Cardinell purchased a three story frame building that was on the property. Cardinell ran the Saint Charles Restaurant on the first floor and the Saint Charles Hotel on the other two floors. 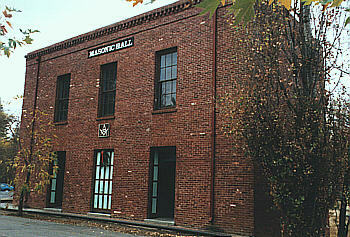 After the building was destroyed in the great fire of 1854, a three story brick structure was built on the lot. The Masons used the upper floor of this building. In 1863 the Masons bought the lower floor. In 1890 the brick building was torn down and the land was mined. The bricks were then used in the Rawhide mine. In 1947 the Columbia Historic Park Association bought the lot from the estate of Tom Conlin and then sold it to the State for $1.00. In 1950 the present building was constructed by the Grand Lodge of Free and Accepted Masons and given to the State in exchange for a fifty year lease.